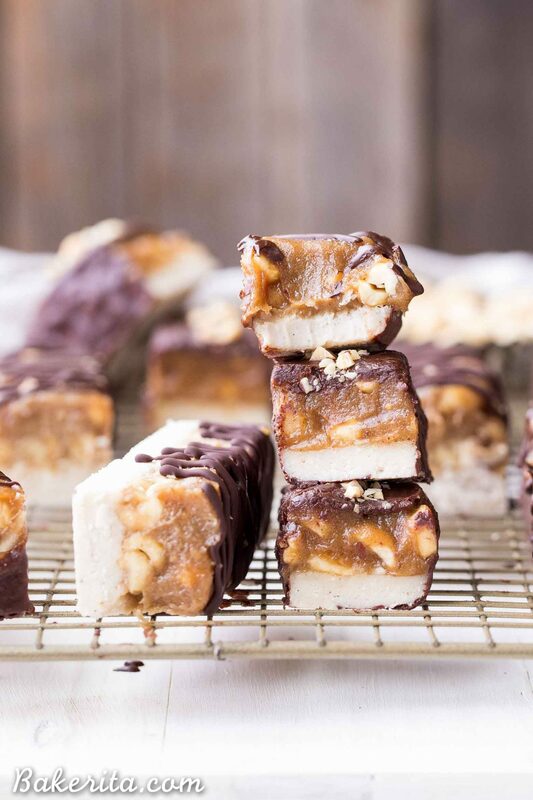 These Homemade Snickers Bars are a healthier version of the classic candy with no baking required! 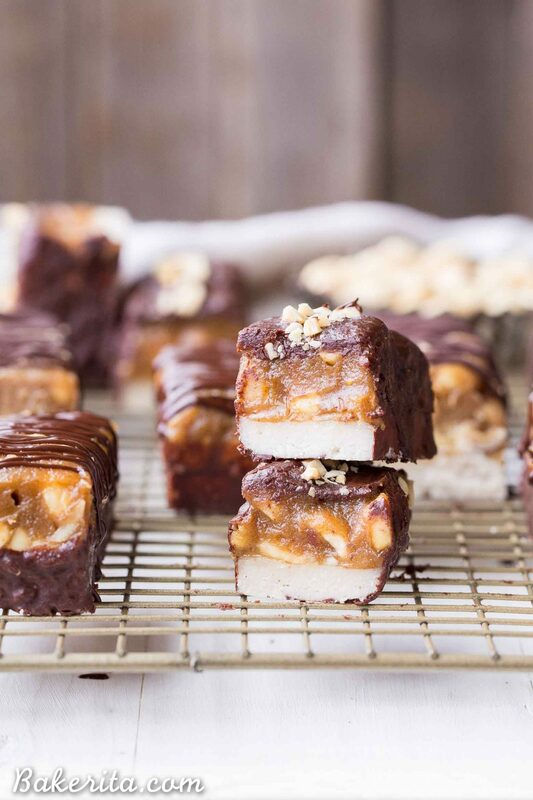 These gluten-free and vegan candy bars have a layer of raw nougat, topped with a peanut date caramel, all dunked in homemade chocolate. 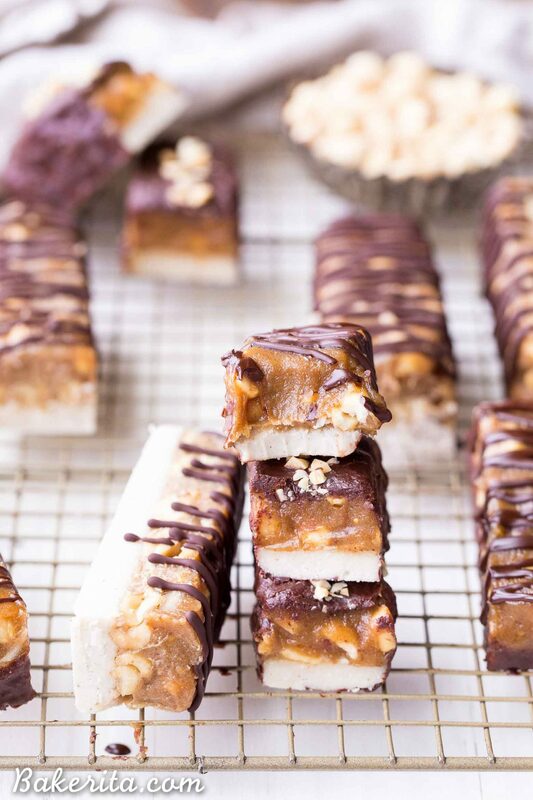 Firm, melt-in-your-mouth nougat, topped with a lusciously creamy and peanut buttery caramel, studded with whole peanuts, all dunked into chocolate? UM, yes please. Does that not sound like everyone’s favorite candy bar??? It sure sounds like one of mine. And it also describes my latest and greatest dessert creation. It definitely doesn’t sound like something that would be gluten free, refined sugar free, and vegan…but IT IS! It’s been a long time since I’ve had a real Snickers bar. Probably a year or two at least, I’d say. Soo I guess that means you should take my comparisons with a grain of salt if you’ve been nomming on real Snickers as of late, but if I do say so myself, these definitely satisfy the candy bar craving. Another bonus? No baking, or cooking, is necessary. The most you’ve got to do is melt some coconut oil and blend some things. They’re really super easy. A small time investment with a BIG reward! First up, the nougat! Soaked cashews provide the creamy base of the nougat, and it’s combined with coconut butter and coconut oil to help it firm up, coconut cream for extra creaminess, maple syrup for sweetness, and a little bit of coconut flour to pull it all together. On top of the nougat is the creamy, luscious peanut butter date caramel. Date caramel can sometimes have a very particular flavor, but with the peanut butter in there, you’d be hard-pressed to guess the base of the caramel was the sweet fruit. 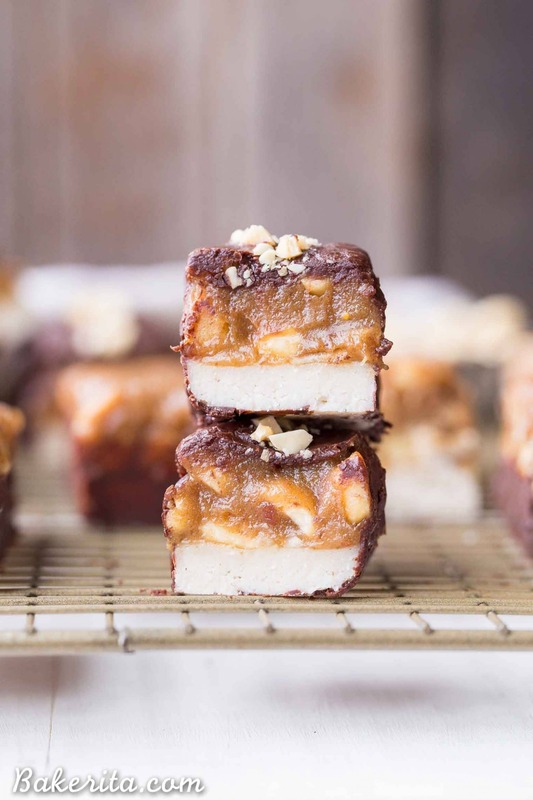 The dates and peanut butter are blended up with a little maple syrup, coconut oil, and salt, and then whole roasted peanuts are stirred into the caramel, to add some crunch. 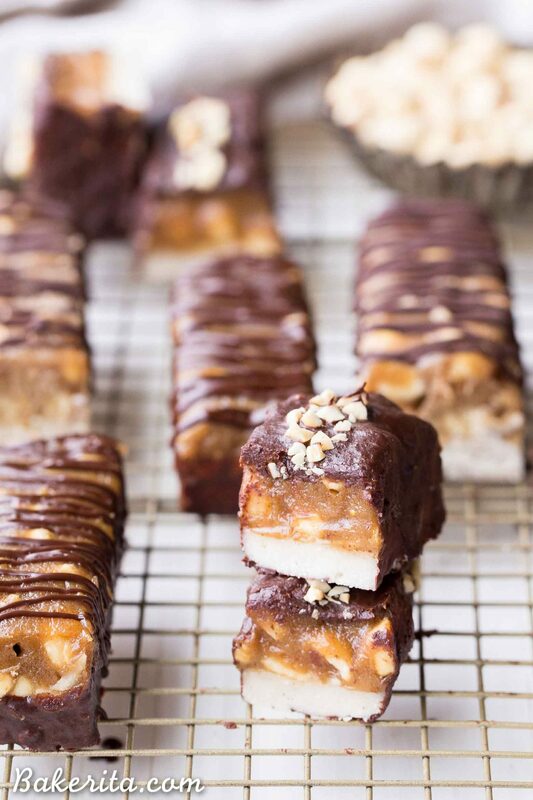 Once they’re layered together, chilled, and cut, the homemade snickers bars get dunked into the homemade chocolate and left to set. You can also drizzle them with chocolate, like I did for some of them, but dunking definitely makes them more snickers-like. The resulting bar is sweet, with a gooey layer of caramel, crunch from the peanuts, and richness from the peanut butter. Obviously, with peanuts, these aren’t paleo. However, just sub in cashew butter + cashews or almond butter + almonds in the recipe to make it totally paleo, and still absolutely delicious. Line an 8x8” square pan with parchment paper and lightly grease with coconut oil. In a high powered blender or food processor (I used my Vitamix), combine the cashews, coconut butter, coconut cream, maple syrup, and melted coconut oil. Blend on medium-high speed until completely combined and smooth. Add in the coconut flour and blend in to combine. Spread the “nougat” bottom into the prepared pan and place into the fridge to firm up while you make the filling. In the same blender or food processor, combine the soft pitted dates, maple syrup, peanut butter, melted coconut oil, and salt. Blend to form a smooth paste, scraping down the sides as necessary to fully combine the caramel. Stir in the roasted peanuts. Spread in an even layer on top of the chilled nougat and return to the refrigerator for at least two hours to firm up, or speed up the process in the freezer for about 30 minutes. Remove the chilled bars from the fridge or freezer and cut with a very sharp knife. You can cut them in half, and then each half into six long slices to create the classic “Snickers” shape, or you can just cut into 16 squares. Return to the freezer to chill while making the chocolate coating. Melt together the coconut oil, maple syrup, and cocoa powder in the microwave for 30 seconds (or until coconut oil is melted) and whisk to combine. Pour into a dish wide and deep enough to dip your bars into, and dip each bar into the chocolate, using forks to dip them in. Make sure to let the excess chocolate dip off. Place on a greased wire rack or parchment paper, and move to the refrigerator to set. Once the chocolate is set, enjoy! Keep these stored in an airtight container in the refrigerator. Total time does not include time required to chill the bars. Thanks so much Natalie, I hope you love them!! Oh, girl! You’re rocking it with these!!! These look delectable… But I’m a bit confused as to why peanuts aren’t considered vegan (“1 cups roasted peanuts use cashews to keep vegan”)? Whoops! Definitely meant to say paleo, not vegan. Peanuts are definitely vegan, but they are not paleo! Hi, just wondering if you roast peanuts in the oven or buy a packet of roasted peanuts to add in..?? Really want to try these.. they look delicious !! Hi Shauna, I usually just buy pre-roasted peanuts! You can roast them yourself if you prefer.